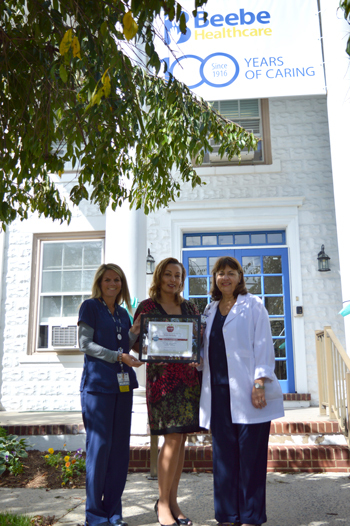 Beebe Healthcare is proud to be recognized as a Health Champion by The American Diabetes Association. The American Diabetes Association launched Wellness Lives HereSM, a new initiative designed to inspire and fuel our nation’s healthful habits at work and beyond. As part of that initiative, they created a Health Champion designation to recognize companies that make health and wellness a priority for their employees. Nutrition and Weight Management: The company must offer healthy food choices, promote knowledge of nutritional information, etc. Physical Activity: The company must participate in physical activity events and promote walking/biking to work, encourage exercise during the day, etc. Organizational Well-Being: The company must promote employee wellbeing, including smoke-free policies, having a designated wellness coordinator, a wellness company, and/or integrate health topics and information into internal communications. Beebe Healthcare’s Employee Wellness team has worked hard for the past several years to provide programs for employees, including Weight Watchers, an annual Battle of the Bulge contest to promote weight loss and healthy eating, healthy meal choices in the cafeterias, and an employee benefits program that rewards team members for meeting health goals. In addition, several programs were run over the past two years to promote increased fitness among team members. The American Diabetes Association is leading the fight to Stop Diabetes and its deadly consequences and fighting for those affected by diabetes. Beebe Healthcare’s Employee Health and wellness teams, along with the Diabetes Management & Medical Nutrition Therapy department, aim to give Beebe team members the tools and knowledge they need to live their healthiest lives. For more information on Beebe’s Diabetes Management program, call (302) 645-3121 or go to https://www.beebehealthcare.org/diabetes-management. Beebe Healthcare is a not-for-profit community healthcare system with a charitable mission to encourage healthy living, prevent illness, and restore optimal health for the people residing, working, or visiting in the communities we serve. It offers services throughout Southern Delaware for residents and visitors, including a 210-licensed-bed hospital, a cancer treatment center, and outpatient facilities providing walk-in care, lab, imaging, and physical rehabilitation services. For more information, please visit us online at www.beebehealthcare.org. Caption: Beebe Healthcare has been named a Health Champion by The American Diabetes Association. Shown accepting the award (left to right) are Jennifer Montgomery, Employee Health Manager for Beebe Healthcare; Monique Sadler, Director of Corporate Development for The American Diabetes Association, Philadelphia office; and Tina Trout, APRN, ACNS-BC, CDE, Certified Diabetes Educator at Beebe Healthcare.